a steeplejack's improver, see (588), who assists and watches the top skilled men, thus gaining knowledge, experience and confidence. erects frame scaffolding for new building by bolting together previously prepared steel tubes, timber, deals, scantlings, posts, etc. assists slate planer (or stone planer) (576 or 575) (q.v.) at planing machine; carries and moves about with levers and rollers, or travelling chains slabs of slate or stone, rope runner (building); a lad who fastens rope to trucks waiting to be moved or shunted on light tramway after filling or unloading on excavation work. removes stone clippings from mason's banker or planing machine. assists slater (570) (q.v.) 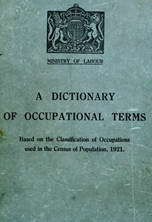 to sort slates; carries them in clumps up scaffolding to roof and lodges clumps slantwise against roof timbers conveniently to hand of slater; mixes mortar or cement for slater and assists him generally. general term for an unskilled worker who assists sawyers and machinists (576) (q.v.) in moving slate and assists generally in slate cutting and dressing mills; includes plane house loader, plane house man. a stone works labourer (q.v.) who carries or assists in moving stone, by means of rollers, levers and chain lifting tackle. weighs and records the weight of blocks of stone received in the stone cutting and dressing mills. as for slate works labourer. collects tools, and takes to forge for repair, e.g., picks. turns handle of a hand winch to raise builder's material up to required level on scaffolding.